This is a fairly big issue and I’ll probably devote more than one post to it. In recent days newspaper headlines have made misleading statements that relate to how to ‘prioritize’ swine flu vaccine (potentially demand will exceeed supply). For example, one headline today ran “Flu vaccine to pregnant women first“. What the study in question actually showed (or, rather, suggested) is that pregnant women may, on average and as a group, be at greater risk for swine flu and swine flu complications. But to keep in mind is that each person’s circumstances are unique. Assessment of flu vaccine candidacy, assuming there’s a vaccine shortage, must consider all relevant factors of a person: medical history, age, risk of exposure, health status, risk of complications, risk of infecting others, etc. While being pregnant is a factor to consider, so are others. It’s not as simple as putting all pregnant women ahead of all non-pregnant women in the ‘queue’, as the headline seems to suggest. Another headline this week similarly suggested “Antiviral drugs for swine flu patients may be wasted on the elderly.” Again this is an incorrect and misleading statement. On average, elderly people perhaps respond less well to antiviral flu medicine (they do show somewhat lower immunoresponse to flu vaccination on average than younger people) ; they areprobably less likely, again on average, to have a lot of contact with children . But there are plenty of people above age 65 who vary from the average. Some respond well to vaccines, some have a lot of contact with children, etc. Decisions to administer antivirals or to give swine flu vaccinations have to be made on a case-by-case basis, considering all relevant aspects of the person and their circumstances. It can easily be shown that approaching vaccine allocation by a blanket rule like “only young people and pregnant women should get the vaccine” would be extremely suboptimal. The degree of suboptimality associated with such rules — or what could be technically termed marginal prediction — can be estimated; in this case such faulty prediction would likely produce considerable excess mortality and morbidity, reduced overall quality of life, and unnecessary loss of many millions of dollars. One alternative is to construct a simple statistical decision tool that would compute a score for each person (e.g., 1 = lowest priority to 100 = highest priority) based on the person’s individual data. This could be put online for people or doctors to use, for example. The data to construct such a tool exists in various places, but would need to be collated and analyzed. At present I’m tentatively planning to develop a prototype tool, hopefully in the next couple of weeks. When the new window opens, press the “Next” button on the lower right to continue. This is the best presentation of its kind available today. Watch it yourself and show it to your family and friends. If enough people follow the simple, common-sense steps outlined here, it can have a significant effect on reducing the swine flu pandemic. Because pandemic disease transmission follows an exponential pattern, even minor preventive steps like those explained here can have a major impact on total disease incidence. I met a college student last weekend and promised her I’d put a post online about the outrageously high cost of college tuition. I’m working on some figures now and hope to post a chart by tomorrow. Meanwhile the bottom line remains the same. It doesn’t matter much which inflation indices or economic indicators one looks at. The brute fact is that when I went to college in the 70’s, students in California didn’t have to take out loans, but today they to have to. Big loans, too. 1. This indicates that we are moving backwards, not forward in terms of higher education in our society. 2. It is unjust, absurd, and socially counterproductive in the extreme to subject youth to this burden. 3. They are being taken advantage of, because they lack the historical perspective to understand that this was not the case 25 or 30 years ago. 4. Nobody is speaking up for them or representing their interests. 5. 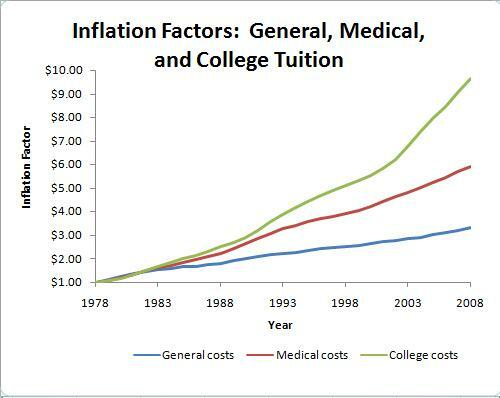 If anything, the costs of a college education should be declining (relative to the cost of living) because computer and internet technology can be used to facilitate distance learning, video lectures, etc. My websites (listed on the panel to the right) are currently under construction. My old service provider (Compuserve Ourworld) has closed, and I’m gradually moving pages to a new provider. This may take a week or two. Please be patient with any broken links, etc.